With all the hullabaloo about the current election it’s a great time to talk about presidents. No, I’m not about to rant or rave about Trump, but here are a few stories about past Presidents who have left their mark on Central Park during their visits to New York. 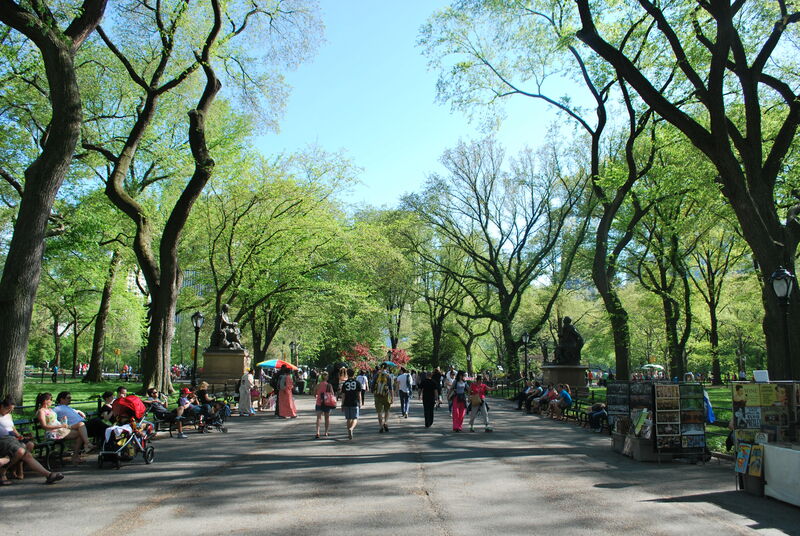 Thirteenth president Millard Fillmore has a long connection to Central Park. In 1847, as New York State comptroller, Fillmore authorized the appropriation of funds to construct the Arsenal, which is now part of Central Park and citywide headquarters for the Parks Department. An honorary façade marker inscribed with Fillmore’s name was placed on the building. Nineteenth president Rutherford B. Hayes opened the American Museum of Natural History on December 22, 1877 in what is now known as Theodore Roosevelt Park. President Hayes also unveiled the Fitz-Greene Halleck statue in Central Park on May 15, 1877. On April 30, 1899, twenty-fifth president William McKinley made a trip to New York. During his visit, McKinley took a cruise on the Hudson, but to get to the dock at 129th Street, the President, First Lady, and their following boarded carriages and cut through Central Park to Riverside Drive. Twenty-ninth President Warren G. Harding spent an afternoon in New York on April 19, 1921 to unveil the Simon Bolivar Statue in Manhattan’s Central Park. He then delivered a major policy address urging greater cooperation within the Americas. Herbert Hoover, the thirty-first president, spent much of his time in New York City–from 1940 until his death in 1964–when he moved into the Waldorf Towers, overlooking Parks’ Park Avenue Malls. Thirty-second president Franklin D. Roosevelt has had a large impact in the city’s parks system. His Works Progress Administration (WPA) programs (after 1939, known as the Work Projects Administration) funded many projects in the city. At the end of World War II Roosevelt’s successor, thirty-third president Harry S. Truman, spoke to 50,000 people at Sheeps Meadow in Central Park on Navy Day, October 27, 1945. On a sadder note, thirty-sixth president Lyndon B. Johnson flew in and out of New York in a helicopter via Central Park’s Sheep Meadow for Robert F. Kennedy’s funeral at St. Patrick’s Cathedral on June 8, 1968. After losing the 1962 California gubernatorial election, thirty-seventh president Richard M. Nixon moved to New York and lived in an apartment overlooking Central Park. Forty-first president George Herbert Walker Bush lived in the Waldorf Towers from 1970 to 1972 while serving as the United States ambassador to the United Nations. Bill Clinton, our forty-second president, set up his post-presidency office in Harlem; the former president surprised Parks Arsenal employees one winter afternoon after a visit to the Central Park Zoo–he graciously shook hands on his way out to Fifth Avenue. While in town for a fundraiser in July of 2015, forty-fourth president Barack Obama strolled through Central Park, stopping for a hot dog before going to see Hamilton with his two daughters, sister and brother-in-law. And although not a president, New York governor Alfred E. Smith, the 1928 Democratic candidate was honored by a sculpture, a playground, a recreation center, a school, and a housing project on the Lower East Side block where he grew up. In retirement, he was given the title honorary zoo night keeper (or some such moniker) and a key to the Central Park Zoo, so he could admit himself at any time.